A wonderful goal from Conor Hourihane gave the Republic of Ireland a 1-0 win over Georgia. But that wasn't the main talking point with a tennis ball protest taking place during the game. Amid protests from the Irish supporters, Hourihane kept his cool to curl home a beautiful free-kick and give Mick McCarthy a well-deserved win on his second homecoming. Republic of Ireland fans threw tennis balls onto the pitch opposing the decision to keep John Delaney in the FAI hierarchy but Hourihane was on hand to serve up a stunner. Goalkeeper Darren Randolph foiled Valeriane Gvilia’s effort just before the half-time whistle, meanwhile, captain Jaba Kankava rattled the post late on. Nevertheless, Mick McCarthy’s side held on for a well-deserved victory and sit two points clear at the top of Euro 2020 qualifying Group D.
In response to the FAI’s decision to appoint John Delaney as executive vice-president of the governing body a protest from the Irish faithful was imminent and it came just after a break in play when man-of-the-match David McGoldrick was upended by Georgia defender Guram Kashia. 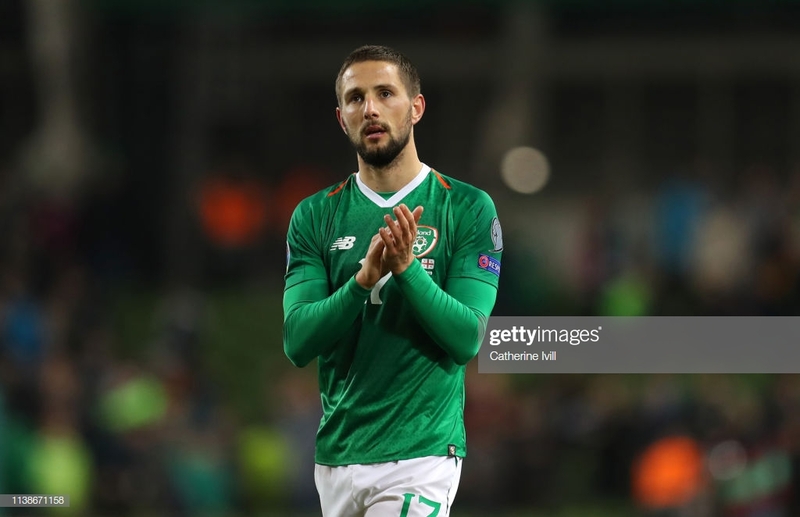 Once the tennis balls were cleared off the turf Aston Villa midfielder Hourihane could find the spot that he had a lot of time to think about and he did so in glorious fashion to score his first ever international goal and give Ireland a deserved lead. The home side started by creating a flurry of openings, first Robbie Brady cut inside on his left-foot and flashed his effort just past the post. Then good pressure from Jeff Hendrick in midfield released Hourihane who was unable to convert with an irate Brady in a better position. The selfless David McGoldrick, who put in a mammoth effort on the night, saw his volley fly just off target and the striker was unable to direct his header goalward when he got on the end of James McClean’s cross. McClean was influential on the left but his end product was somewhat lacking. That too can be said of captain Seamus Coleman’s who made enterprising runs on the right but couldn’t pick out his man in the centre when he got into advanced positions. Despite their early dominance and eventual lead, Ireland were almost pegged back just before the interval. Darren Randolph was on hand to beat away Gvilia’s effort from inside the area and McClean had tracked back to clear it out for a corner. In the second-half, the men of the Emerald Isle scuppered further chances and could’ve been made to rue their missed opportunities if it weren’t for the width of the woodwork. On the 84th minute Georgia captain Kankava crashed a rasping effort off the post, an attempt that had Randolph beating all ends up in goal. Earlier in the half Enda Stevens missed a gilt-edged chance inside the Georgia box after Jeff Hendrick was denied a second goal in as many games by the linesman. Hendrick had strayed into an offside position and the official was right to raise his flag to shorten celebrations in the Aviva Stadium. Nonetheless the Irish held out for an important victory after Switzerland squandered a 3-0 lead against Denmark in the last six minutes meaning the Irish sit outright at the top of the group with their next qualifier away to the Danes on June 7th.